Schematic representation of the SXDS_gPC region. Credit: Jiang et al., 2018. An international team of astronomers reports the discovery of a new giant protocluster of galaxies. The newly found protocluster was identified at a redshift of 5.7, when the universe was about 1 billion years old. The finding is detailed in a paper published October 15 on the arXiv pre-print server. Galaxy clusters contain from hundreds to thousands of galaxies bound together by gravity. They are the largest known gravitationally bound structures in the universe, which could serve as excellent laboratories for studying galaxy evolution and cosmology. Astronomers are especially interested in finding protoclusters of galaxies, the progenitors of clusters. Such objects, found at high redshifts, could provide essential information about the universe at its early stages. However, detecting these structures at high redshifts is challenging, requiring deep, wide-area surveys for proper identification. Recently, a group of researchers led by Linhua Jiang of Peking University in Beijing, China, employed the M2FS fiber-fed, multi-object spectrograph mounted on the 6.5-m Magellan Clay telescope at Las Campanas Observatory in Chile to conduct a spectroscopic survey of galaxies in four square degrees of the sky. The observations were focused on identifying new luminous Lyman-alpha-emitting galaxies (Lyman-alpha emitters or LAEs) at redshifts between 5.7 and 6.5. 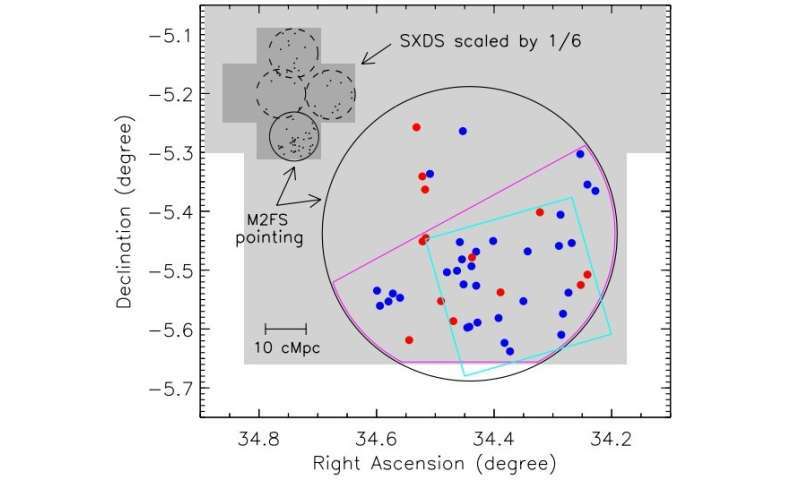 The study found dozens of LAE candidates and spotted an overdensity of such objects at a redshift of 5.7 in the XMM-Newton Deep Survey (SXDS) field. The research detected the existence of a giant protocluster in this overdense region, which received provisional designation SXDS_gPC. "The combined SXDS images in five broad-band filters (BVRi'z') and two narrow-band filters (NB816 and NB921) have enabled us to efficiently select LAE candidates at z ≈ 5.7 and 6.5 via the Lyα technique. From these LAE candidates, we identified a large overdense region at z ≈ 5.7 in the SXDS. Here, we show that this overdense region contains a giant protocluster (SXDS_gPC for short) that will grow into a massive galaxy cluster," the paper reads. According to the study, SXDS_gPC, which is expected to collapse into a giant galaxy cluster, occupies a volume of about 35 x 35 x 35 cubic co-moving megaparsecs and a present-day mass of approximately 3.6 quadrillion solar masses. This makes it one of the most massive clusters or protoclusters known to date. The researchers emphasized that their discovery proves the existence of giant protoclusters at high redshifts. Hence, the finding contradicts the cold dark matter model predicting that small structures merge hierarchically to form large structures. "The progenitor of SXDS_gPC is likely such a high-density region in the reionization era. Our results fit well into this scenario, and may provide direct evidence for the existence of large-scale clustering required by the above reionization theory," the researchers concluded. Just more problems for the merger maniacs and their favorite Huge Bang Fantasy. It should be noted that the use of the phrase "contradicts" is a (poor) choice of the journalist that wrote the article, not the scientists that wrote the paper. In fact, if you read the paper linked above, the proto-cluster has almost all of the properties predicted in LambdaCDM. The problem is that proto-clusters of this size are very rare in the simulations to which the paper compares the data, and this came as something of a surprise. It could therefore just be an extremely large example (which, after all, are the easiest to detect). Alternatively, there may still be problems with our simulations of the early universe. One of the motivations for this kind of research is to test these sorts of ideas. Yes, Newton is simply wrong at galactic scales. He's wrong at the quantum level. Why such a surprise if he's wrong at the other end of the spectrum too? Thank you RNP for a concise explanation of the difference between a research paper submitted for peer review. And the pop-science/clickbait headlines of garbled articles such as this. Written and edited by non-scientists. It amuses me, the anti-science commentators. Who have previously, so vehemently, rejected computer modeling and simulations as inherently flawed. When the results contradicted their cherished ignorance. Those same commentators whiplashing themselves to reverse their opinions. When, in the depth of their ignorance, they opinionate that the touted article supports their belief systems. Hilarious, when you realize all those models and simulations are based on the same method of evaluating data and statistically manipulating the known variables. Just proves they have at best, a seriously shallow knowledge of the sciences for which they claim to have a unique understanding. "Perhaps the simulations' single biggest lesson so far is not that scientists need to revise their overarching theory of cosmology, but rather that problems lurk in their understanding of astrophysics at smaller scales. In particular, their theory of star formation comes up wanting, Springel says. ... But many galaxy modelers believe the recipes will always be complicated and uncertain. Galaxy formation may be like the weather, which keeps precise predictions forever out of reach because of its chaotic nature..."
There are some very complicated issues of galaxy formation. Unfortunately, here is the same problem as with the stars. The origin of galaxies remains unclear, in spite of huge activity in the field. "Academia.edu is not an educationally-affiliated organization, but a dot-com, which has raised millions in multiple rounds of venture capital funding." Historian Seth Denbo probably said it best when, almost a year and a half ago, he warned scholars that they were providing free data to a for-profit company rather than participating in an open-source, non-profit often associated with .edu domains." Well old_coot, could you assist all of the rest of us? By specifically naming the BB theorists you accuse of criminal fraud? And linking their papers denying the existence of galaxies at minus one or two billion years post BB. So we too can chorus your denunciation of the conspirators! Not just repeating (slanderous?) (libelous?) (cootiest?) claims to unspecified and unproven knowledge by anti-science loons. @O_C_C makes a valid observation regarding the hypothesized BB-dependent 'timeline' for formation/evolution of large astronomical/cosmic 'features/structures'; which neither of you have actually addressed properly. @Jonesdave - so what you are saying is that it is difficult to grasp how a real life observation completely falsifies the BB theory and all the theorists refuse to acknowledge that fact? You did see the scenarios they've postulated to rescue the fallen theory, did you not? Do you think it's rational? Is it because there is no alternately acceptable theory? Or is it because the one theory that does make sense is simply not allowed a foot in the door? This is not the first hint that the original clusters and galaxies formed earlier than middle-of-the-road LCDM simulations have so far postdicted. What's going to be interesting is watching what the dynamics that made this happen turn out to be. @Old_C and @Jones, keep in mind the difference between proper and comoving distance, as well, because the greatest difference between them is at the greatest distance. So, @Old_C, by which coordinates are you speaking when you speak of galaxies 13 billion light years away? The dynamic bounce solution of Feynman 'biggest mystery of physics' continually balances the contracting/expanding motion energy of total mass M in Riemann 4-sphere (starting point of Einstein GR) with its 'anti-matter' or gravitational energy BEFORE and AFTER the 'bounce'. This connects the expansion speed C4 OF the 3-D space with variable speed of light C_true IN the space to 4-radius R4 (=13.8B l.y today) and dynamic Newtonian time T4 (=9.2 B yrs today). The 0-energy balance in expanding space also slows down ticking rate of atomic clocks such that locally OBSERVABLE or apparent C_obs = constant - fooling the starting point of GR. A galaxy at optical distance of 13B l.y was only128 M (vs. 800 M) yrs from T4=0 bounce and with C4=C_true= sqrt(13.8/0.8) times C_today with about 75 times today's ticking rate of high energy level atomic processes. You may wonder what happened at T4= -128 M dynamic years before the bounce? Nothing special unlike the BB theory where suddenly the total mass M of universe was supposedly created at T4=0 - the same mass M existed an infinite time BEFORE and AFTER the DU bounce. Its energized matter forms (no need to know distribution among the 'dark' and structured matter) of balanced motion and gravitation simply changed from accelerated contraction to decelerating expansion stages preserving the structure of the observed proto cluster. The +/- 128 M yrs periods to T4=0 from R4=0.8 B ly are today at T4=9.2B yrs extended to 800M yrs due to the slowing ticking rate and decelerating values of C4=C as confirmed by Earth based observations of coral fossils, see Suntola DU book explaining also some 5-10 other mistaken postulates of GR/QM such as DE and Planck constant. @ FredJose 'Or is it because the one theory that does make sense is simply not allowed a foot in the door? Suntola made DU break-through in 1995 compiling DU books with annual papers and presentations at PIRT and other international GR expert meetings about practical DU proofs since ancient times. The 1998 SN1a data provided an intergalactic test case where the GR based cosmology starts to fail revealing details of the corollaries of the mistaken starting point of GR/QM about the postulate of constant C and Planck constant. The new physical DU model of SN1a has no use for the auxiliary 'epicycle' parameters of DE/DM. Despite annual DU papers to explain SN1a data, 2011 Nobel 'confirmed' the mistaken DE interpretation! Flood gates opened to chase more Nobels based on the 'proven' BB and other GR based postulates, including 2017 GW saga of my past posts based on the surveying math of Gaussian array Toe (Theory of estimation in extended tensor/matrix calculus).